Hear me roar – I’m learning to sail during a Canadian winter in Ottawa, while looking after four children on my own. 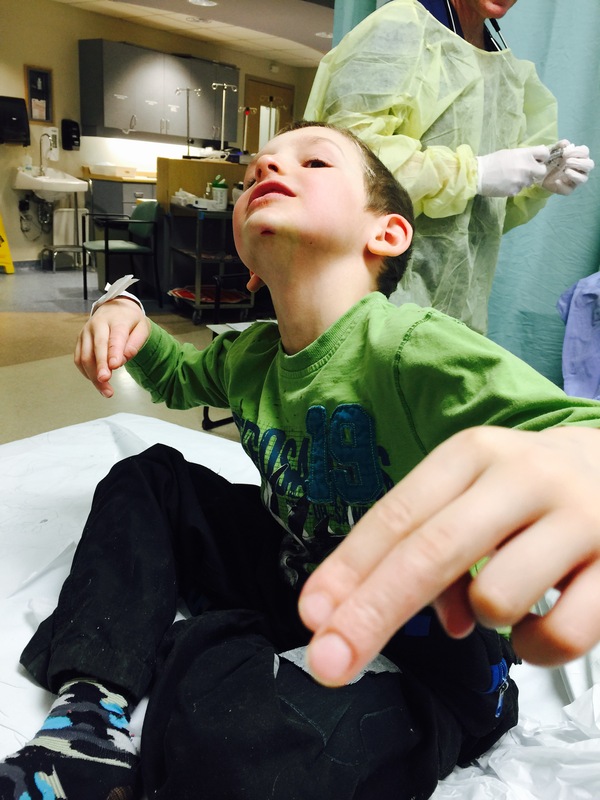 Unfortunately, this weekend involved a trip to the emergency room with my 6-year old son, Paul. Paul cut his chin on the edge of our outdoor hockey rink, and required three stitches. Here is a picture of Paul doing gang hands at the hospital as he awaits being stitched. He had freezing applied, which is why his chin is whiter than the rest of his skin. Meanwhile, my husband is at Grenada Sailing Week with his own share of trouble. If our lives had physically intersected this weekend, we would have been dealing with a cut chin, and a boat repair. One of my husband’s races ended early because the car broke loose on the boat he was on. The term “car” was unfamilar to me. So, it was a good opportunity for me to learn something new. 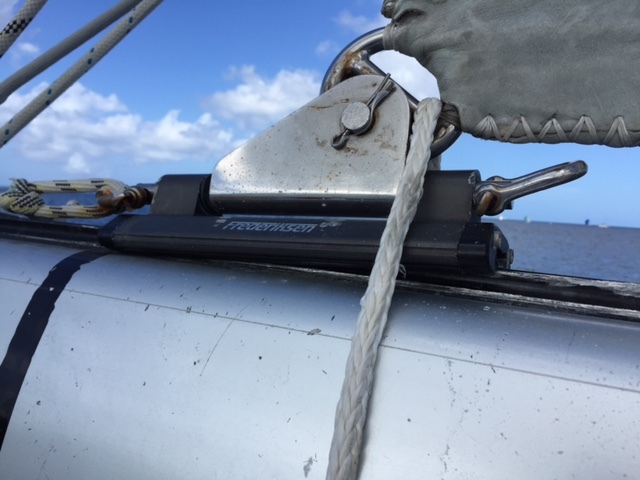 For the benefit of other sailing newbies like me, the car is a sliding mechanism that runs along a track on the aft part of the boom. The car carries the outhaul sheet that puts tension or slack in the sail. Here is a picture of the car – also known as the outhaul car – as it starts to malfunction on the SV Spirit of Juno, which is the sail boat that my husband was on. The white rope was put in place as a precaution in case the car completely slipped off the track. And, here is a picture of it after it came off , which forced the crew to end their race early. Outhaul car breaks free of the track. The race is over for the SV Spirit of Juno. To better understand the role of the outhaul, I found the following Youtube video to be helpful. The video demonstrates how the outhaul sheet moves back and forth along the boom. 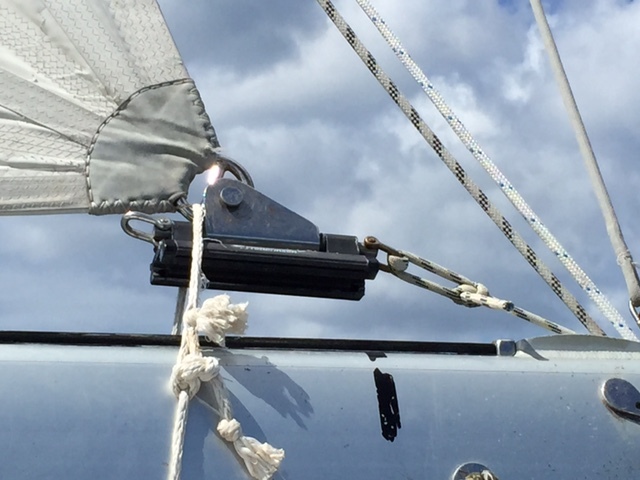 The presenter stresses that the outhaul controls the bottom 1/3 of the sail, while the backstay controls the top 2/3. In this video, it appears that the outhaul sheet is not placed on an outhaul car, but rather it is tied around the boom. I find that I’m learning more right now through chance encounters more so than with formal training. There are so many distractions right now that it is difficult to pull together the hours needed for my theory course. I imagine it’s like learning any other language. There’s nothing quite like immersion. In Ottawa, sailing doesn’t begin in earnest until May. So, I’m headed to Antigua in April. And, I will step away from my books to crew with Ondeck sailing. I am excited and a little nervous. Our kids are used to their dad traveling for business. But, this is the first time that I will be leaving my family. It will be a big step for me and for our family as it will push us closer to our goals of becoming competent sailors, and full-time cruisers.